A Russian-built Soyuz rocket launched Tuesday from the Guiana Space Center on the northeastern coast of South America, boosting Europe’s MetOp-C satellite into orbit to benefit weather forecasters worldwide and closing out a generation of weather-observing technology. The 9,003-pound (4,084-kilogram) weather satellite lifted off from French Guiana atop the Soyuz ST-B launcher at 7:47:27 p.m. EST Tuesday (0047:27 GMT Wednesday). Heading toward the north over the Atlantic Ocean, the kerosene-fueled rocket released four first stage boosters around two minutes after liftoff, then jettisoned a shroud covering the MetOp-C satellite after climbing into the thin layers of the upper atmosphere. The Soyuz core stage shut down just prior to the five-minute mark of the mission, and a third stage RD-0124 engine ignited to accelerate the MetOp-C spacecraft and a Russian-made Fregat upper stage to near-orbital velocity. 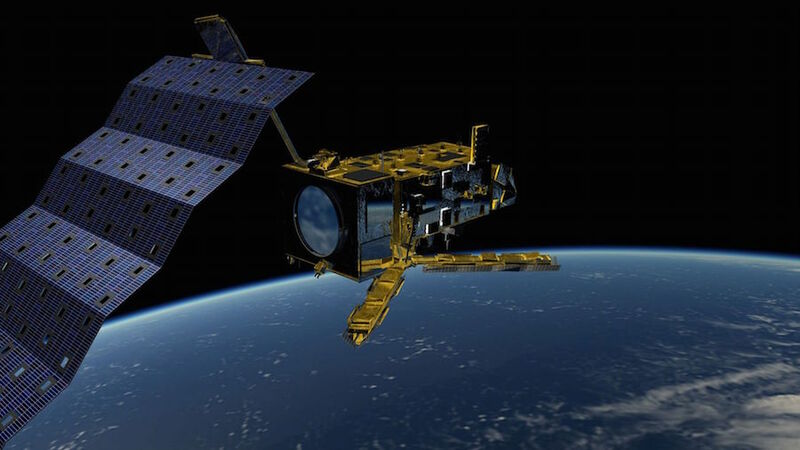 The Fregat engine fired two times to maneuver the MetOp-C satellite into a polar orbit around 500 miles (800 kilometers) above Earth, flying at an angle of 98.7 degrees to the equator. The new weather observatory, owned by the European weather satellite agency Eumetsat, deployed from the Fregat rocket stage one hour after blastoff as it soared over a ground station in Australia. 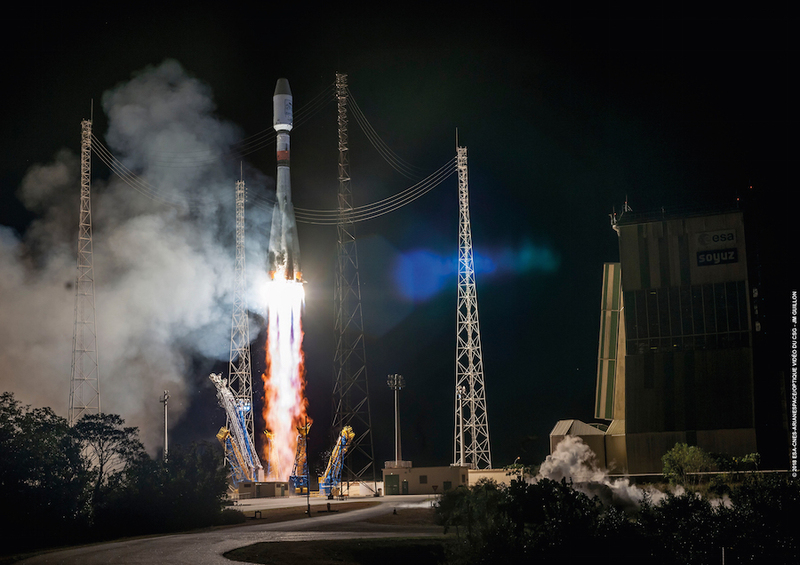 Arianespace, the French company responsible for Soyuz launches from French Guiana, declared the mission a success. Ground controllers at the European Space Agency’s operations center in Darmstadt, Germany, confirmed the on-target separation of the new weather satellite. Engineers tracking the satellite’s progress later verified the extension of MetOp-C’s solar panel, a key milestone to begin charging the craft’s batteries. Built by Airbus Defense and Space, the satellite is the the third in a line of Eumetsat polar-orbiting weather observatories. MetOp-C is the last in Eumetsat’s current generation of weather satellites in low Earth orbit, and a new line of six European polar-orbiting meteorological spacecraft — dividing sounding and imaging capabilities into two different satellite designs — will begin launching in 2022. With MetOp-C’s successful launch Tuesday night, Eumetsat has a fleet of three nearly identical satellites in polar orbit. MetOp-A launched in 2006, and MetOp-B has been in orbit since 2012. Both flew into space atop Soyuz rockets from the Baikonur Cosmodrome in Kazakhstan, and were designed for five-year missions — like MetOp-C. The three-satellite program cost around $4 billion (3.5 billion euros), including the spacecraft, launch services and operations expenses funded by Eumetsat, the European Space Agency, and the French space agency CNES, according to Paul Counet, Eumetsat’s head of strategy, communication and international relations. “Our EPS (Eumetsat Polar System) and its MetOp satellites equipped with innovative European instruments has brought meteorological observation from the polar orbit to a new standard, and this is another success of our cooperation with ESA,” Ratier said in a post-launch statement. Meteorologists expect the addition of a third MetOp satellite will result in improved data to feed into weather prediction models. MetOp-C will fly in roughly the same orbit as its two predecessor satellites, with a slight time lag. “I think it’s very motivating, this tristar constellation that we will have with the MetOp satellites — the first time in operations we’ll have that — because it means that every single point on Earth will be observed three times in very rapid succession of 30 minutes,” said Florence Rabier, director-general at the European Center for Medium-Range Weather Forecasts. The three satellites are expected to work together until the MetOp-A spacecraft is retired in early 2022. Officials never planned for three MetOp satellites to operate simultaneously, but the long lifetimes of MetOp-C’s predecessors prompted Eumetsat to upgrade its control center to capitalize on the potential for better weather data. The MetOp satellites are part of a trans-Atlantic partnership between Eumetsat and NOAA, which owns the U.S. fleet of civilian weather monitoring spacecraft. NOAA’s polar-orbiting weather satellites circle Earth in orbits that pass overhead in the afternoon, local time, while the MetOp satellites provide mid-morning coverage. Forecasters also use data from the U.S. Air Force’s polar-orbiting weather observatories, which fly in orbits with early morning passes. The open data-sharing scheme ensures meteorologists in the United States, Europe, and around the world have a broader picture of conditions that drive the formation and movement of weather systems. Weather satellites in polar orbits are best suited to gather information on storms and atmospheric dynamics that go into numerical weather prediction models for medium-range forecasts from 12 hours to 10 days out, according to Eumetsat. NOAA, Eumetsat and weather agencies in Russia, India, China, South Korea and Japan also operate weather satellites in geostationary orbit more than 22,000 miles (nearly 36,000 kilometers) over the equator, providing near real-time imagery useful for shorter-term forecasting. MetOp-C carries instruments to monitor temperature, humidity, trace gases, ozone, and wind speed over the ocean. Several of the instruments were provided by NOAA, in exchange for European instrument contributions flying on U.S. weather satellites. The three NOAA-provided instruments aboard MetOp-C include the Advanced Very High Resolution Radiometer (AVHRR) built by Harris Corp. in Fort Wayne, Indiana, used for global cloud cover and surface temperature measurements. The radiometer is the last of its type to launch, following a series of AVHRR instruments flown aboard U.S. and European weather satellites since 1978. The Advanced Microwave Sounding Unit, built by Northrop Grumman in Asuza, California, is also aboard the MetOp-C satellite. The microwave sounder collects moisture profiles in the atmosphere, and is the last of its type to launch on a polar-0rbiting weather satellite. Future NOAA and Eumetsat weather satellites will carry modernized instruments to collect similar, or improved, data. The other U.S.-built instrument on MetOp-C is the Space Environment Monitor, which collects data on space weather in low Earth orbit. Two U.S.-provided instruments that flew on the first two MetOp satellites — the High-resolution Infrared Radiation Sounder and a communications package to relay distress signals to search-and-rescue forces — did not fly on MetOp-C, according to Counet. MetOp-C’s European instruments include the French-built Infrared Atmospheric Sounder Interferometer for vertical atmospheric profiling and surface temperature monitoring, Microwave Humidity Sounder for atmospheric moisture data, the Advanced Scatterometer to measure winds over the oceans, the Global Ozone Monitoring Experiment, and the GNSS Receiver for Atmospheric Sounding, which measures the distortion of GPS navigation signals as they pass through the atmosphere. It’s expected that every forecast agency around the world will use MetOp-C’s data. An Argos receiver is also on MetOp-C to relay data from small transmitters attached to ships, buoys, and wildlife to track environmental changes and animal movements. Tuesday night’s launch marked the third consecutive successful flight of a a Soyuz rocket since a Soyuz-FG booster failure led to the emergency landing of a two-man crew shortly after liftoff Oct. 11 from Kazakhstan en route to the International Space Station. The next station crew is scheduled for launch Dec. 3, following one more Soyuz launch planned for Nov. 16 carrying a Progress cargo freighter to the space station. The next launch for Arianespace is scheduled for Nov. 20, when a solid-fueled Vega launcher will carry a Moroccan military optical reconnaissance satellite to orbit.